Russian airstrikes drove Islamic State of Iraq and Levant (ISIL) forces out of Palmyra in Syria hours after the terror group had retaken the ancient city. Russia’s defense ministry said its warplanes carried out more than 60 strikes on Palmyra late on Dec. 10 and into the early morning hours of Dec. 11. “Over the past night, Syrian government troops with active support of the Russian air force thwarted all terrorist attacks on Palmyra,” the ministry said in a statement. “The attacking militants actively used car bombs with suicide bombers, armored vehicles and rocket artillery,” it said, adding that the strikes killed more than 300 militants and destroyed 11 tanks and 31 vehicles. 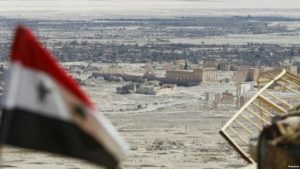 “The (Syrian) army brought reinforcements into Palmyra last night, and the raids are continuing on jihadist positions around the city,” Rami Abdel Rahman of the Syrian Observatory for Human Rights told AFP. ISIL, which seized Palmyra in May 2015 but was driven out in March 2016, began a new offensive last week near the historic city, which is on UNESCO’s World Heritage list. The jihadists killed some 50 members of Syrian government forces after launching simultaneous attacks on several regime positions near Palmyra on Dec. 8, the Britain-based Observatory said at the time. ISIL fighters targeted areas including near the Mahr and Shaar oil and gas fields and seized government checkpoints, silos and the village of Jazal, northwest of Palmyra.